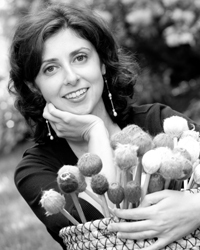 Bulgarian-born percussionist Sylvie Zakarian, a winner of international music competitions, has given critically acclaimed recitals at such venues as Weill Recital Hall and Town Hall Theater in New York; the Wilshire Ebell Theater in Los Angeles; the Regis College Theater; and the Berklee Performance Center in Boston. She has also been a soloist and premiered new works with the National Academy of Music orchestra in Bulgaria, The Ensemble for Contemporary Music at the Royal College of Music in London, Quincy Symphony Orchestra and Melrose Symphony Orchestra in Boston. New York Concert Review writes about her performance: "[A Selection of Children's Songs] ... had a winning immediacy and eloquent simplicity that were enhanced by Ms Zakarian's direct and subtle artistry; by her superb rhythm; and by her ability to phrase and to color." Ms. Zakarian holds degrees with honors in Percussion and Marimba Performance from The Royal College of Music in London and The Boston Conservatory. At the Royal College of Music, Ms. Zakarian was awarded the ARCO scholarship given to a solo performer by The Good Offices of His Royal Highness, the Prince of Wales. She also played in a number of prestigious venues including The Royal Overseas League and The Chelsea Festival. She made her British radio debut on the BBC's "Classic FM," and a year later performed a recital on BBC Radio 3's "Young Artist's Forum." Ms. Zakarian has worked closely with contemporary composers who have written new music for percussion and solo marimba and has given world premier performances. Ms. Zakarian has held master classes and workshops for young musicians at the Purcell School of Music, Royal College of Music, and Berkshire Young Musician's Trust in the UK. Also, she has led music clinics in her native country of Bulgaria with the State Conservatory and the Varna Summer Music Festival. In addition to WCMS, Ms. Zakarian is currently on the faculty of Longy School of Music as well as an affiliate at the Office for the Arts at Harvard University.